KIEV, Ukraine -- The Ukrainian parliament Friday adopted a budget for 2016 with a deficit of 3 percent of GDP, crucial for unlocking much needed aid from the IMF and Western countries. 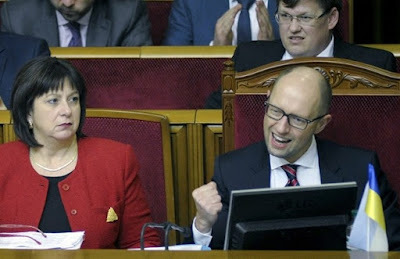 Ukraine's Prime Minister Arseny Yatseniuk (R) reacts as Finance Minister Natalia Yaresko sits nearby during a session of parliament in Kiev, Ukraine, December 24, 2015. The budget was passed after an acrimonious all-night debate and was finally approved by 263 lawmakers, about 40 more than the minimum required number. The cash-strapped and war-scarred country badly needs aid and this move is crucial in unlocking the release of a delayed $1.7 billion (1.6 billion euro) loan from the International Monetary Fund and other Western aid. "The process was long and painful," Finance Minister Natalie Jaresko said on Facebook. Lawmakers were opposed to the government's plan of raising taxes to boost budget revenues and planned austerity measures. The IMF and the world's richest nations that form the G7 group and firmly back Kiev in its 20-month conflict with pro-Russian insurgents have said Ukraine would never achieve sustainable growth without a wider tax base that removes privileges for both individuals and firms. Ukraine crept out of recession in the third quarter but is still on track to see a fall of about 10 percent gross domestic product for 2015. My congratulations to Ukraine and (even) to its political establishment. They have shown (at least on this one occasion) a level of political maturity that has been lacking in many other countries that should know better. The U.S., for example, has been burying itself further and further in debt but there has not been an iota of "push-back" from either of the two parties in power or from either chamber of Congress. It will also be interesting to see how Greece - the cradle of western civilization - handles its far more profligate and debt-financed budget.